Arvind Kejriwal is one of the most discussed and famous names in recent past not only in India but entire globe. His activities and deeds present a paradoxical picture of a genius on one hand and confused and imbecile person on the other. His thoughts are endowed with the intellect of a genius but his modus operandi shows the glimpse of an illusive and amateur man who lack tact and wisdom and make the people fall prey to his paralogism and insouciance. Let's study Numerologically, what is extraordinarily special in his chart which lead him climb the zenith at one moment and hit the nadar, the next. Arvind Kejriwal has always been in limelight for his ambitious maneuverings since last few years by some cause or the other. He entered into politics in 2013 and laid the foundation of a new political party named Aam Aadmi Party alias AAP. In a short span of time this party gained prominence, fame and distinction and excelled in the Dec. 2013 Delhi Assembly polls though it could not be able to get clear cut majority. However, Arvind Kejriwal formed the Govt. from the outside support of 8 congress and One JDU legislators and himself was designated the Chief Minister of Delhi. But Arvind could not fulfil the aspirations and expectations of his voters and the people of Delhi and resigned after 49 days without any significant achievement and any appropriate reason though he provided some silly excuses. He is an ambitious man and was greatly overwhelmed by the success in assembly polls. His intention now was to show his strength and cash his popularity in coming parliamentary election. He failed here miserably and in spite of contesting in 432 parliamentary constituencies, the maximum by any political party in the country, could be able to win only 4 seats. His dream of sudden elevation from C.M. to P.M. shattered in a moment and the graph of his popularity received a fatal blow and since then coming down vertically. Arvind Kejriwal is one of the most discussed and famous names in recent past not only in India but entire globe. His activities and deeds present a paradoxical picture of a genius on one hand and confused and imbecile person on the other. His thoughts are endowed with the intellect of a genius but his modus operandi shows the glimpse of an illusive and amateur man who lack tact and wisdom and make the people fall prey to his paralogism and insouciance. Let's study Numerologically, what is extraordinarily special in his chart which lead him climb the zenith at one moment and hit the nadar, the next. Let's prepare his chart and study the inherent facts which compel him every now and then to see grand success and the worst failure side by side within short span. Arvind Kejriwal’s Talent Number 19/1 and Destiny Number 13/4, both are Karmic Numbers, so the promise of ups and downs throughout the life. But it also promises success in humanitarian disposition done for a greater cause of society or the world. If Talent Number and the Destiny Number both appear as Karmic numbers, a person is destined to struggle in material world. The most outstanding feature of his chart is the multiple forces of Karmic 13/4- Destiny Number 13/4, Pinnacle 13/4 up to the age of 44 ably supported by the special frequency of 4. This enabled him to fight for the establishment of system and order, corruption free society with patience, firmness, hard work and determination. Heart Number 7 supported by the Birth Number 7 bent his heart towards bringing perfection in the society so that no one could fall prey to injustice and inequality. Special frequency of 9 and Personality Number 6 gave him artistic and creative talent to accomplish his philanthropic work for the greater cause of humanity with ease and perfection while the frequent occurrence of number 5 as Event Numbers supported by Name Number and Habit Number 5, Number 5 on Physical Plane provided him with constructive freedom to take exciting, adventurous and risky decisions from time to time. Another important feature in his chart is the presence of a Physical Number 5 on Physical Plane which gave him excessive energy and the power to take decisions freely. However, there are frequent recurrence of contradictory Numbers due to which he is compelled to take dubious decisions and that shapes his character as mixture of opposites. Living true to all these numbers he decided to work for the cause of humanity and for the upliftment of the poor and destitute in the society even though he had been in a very good service and enjoying power, authority, position and all the material comforts. Arvind completed his IIT from Kharagpur in 1989 and competed in Indian Revenue Service in 1995 but realizing the corruption prevalent everywhere in Govt. official set ups, he decided to fight to bring transparency in the system and hence finally resigned in 2006. Though the numbers in his chart also reveal his latent and inherent desire to grab power and fulfil his ambitious materialistic designs. Let us now examine some of the important events which took place between 1991 to 2014 and some future trends of his life. In 1992, he resigned from Tata Steel where he was working since 1989 after the completion of his IIT. In 1992, he was under the influence of Pinnacle 13/4 and Event Number 14/5 both Karmic Numbers. Specially Event Number 5 indicates change whenever it appears. In 1995, he joined IRS when his Event Number 1 with the forces of letters N and W equal to 5 behind indicating change was operating. So, undoubtedly it was the time for some new ventures. In 2006, he resigned finally from his jobs and take up social activity and service. In 2006, again Event Number 14/5 and Pinnacle 13/4 were operating indicating change and ups and downs in career and profession. The same year, he got the prestigious Raymon Magsaysay Award for emergent leadership for activating India’s Right to Information Movement at grass roots and social activities to empower the poorest citizens to fight corruption by holding the Govt. answerable to the people. Such recognition and honour can be had during these Karmic periods if worked for humanitarian cause. Arvind became a key member of 'India Against Corruption' and gained prominence in Anna movement for Jan Lokpal as his close associate. Later on, he parted ways with Anna Hazare as he was reluctant to enter into politics. In Assembly election of Delhi in Dec. 2013, his party performed very well and he was designated the C.M. But he resigned in just 49 days. Since, the time his popularity is at stake and he is losing the support base of public after Loksabha election. At the time of Delhi Assembly and Lok Sabha elections his Event number was 13/4 which is a Karmic Number and Pinnacle 8 is a highly materialistic number and giver of worldly success. Besides that the combination of Nos. 4 & 8 is good for material success. other supporting numbers are also favourable but contradictory in nature. That's why Arvind got success in Assembly polls but could not carry forward the success for long and his popularity declined drastically. In forthcoming Assembly election in Delhi, his party won't be able to maintain the number of seats which it won in 2013 and will come significantly down. From 2015, his Event Number 18/9 will start and pinnacle 8 will continue. The combination of both these numbers are not good for material success. however, if he concentrates on his charitable disposition and philanthropic work, he will get immense success. His life is marred with Karmicness and inspite of his worldly ambitions, he is not made to achieve success in the endeavour. If he works for the cause of humanity, undoubtedly, he will achieve name, fame & recognition. Let us examine his chart now throuh different variants at Lo Shu charts and analyse his traits and almighty's indications through Numerology towards his goals and future course of action. Arvind Kejriwal Date of Birth – June 16, 1968 Lunar Date of Birth – May 21, 1968 Full Name – Arvind Kejriwal Arrows of Strength – 1. Will Power 2. Prosperity Arrow of weakness – None Strong Planes – 1. Activity, 2. Material Missing Numbers – 3, 4 & 7 Arrows of Strength –Prosperity Arrow of weakness – Loneliness Strong planes – Material Missing Numbers – 2, 3, 4, 5 & 7 Arrows of Strength –None Arrow of weakness – Skepticism Strong planes – None Missing Numbers – 2, 3, 4, 5 & 7 Analysis of Lunar Lo Shu Grid The strongest point in Kejriwal’s Chart is the manifestation of two Arrows of Strength – Will Power and Prosperity. As we know that he is a great fighter and has strong will power. On account of his fighting spirit and sheer will power he never hesitated in sacrificing his jobs for the greater cause of social activity. He has done commendable job for the eradication of corruption through his protests. In 2006, he got the prestigious Raymon Magsaysay Award for emergent leadership for activating India’s Right to Information Movement at grass roots and social activities to empower the poorest citizens to fight corruption by holding the Govt. answerable to the people. For the same reason, he sacrificed even his Govt. in Delhi in 2014. He never compromises with his ideology and always fights for the upliftment and prosperity of common man. Two strong planes in the form of Activity and Material provide him the required energy to engage himself in the activities tirelessly for the material prosperity of the common man. Strong material plane also shows his high ambitious attitude. Though he has not shown much interest in money minting but it may be his hidden desire to live lavishly and earn riches and wealth. Analysis of Solar Lo Shu Grid This chart is almost the same as Lunar chart except one inherent weakness in the form of loneliness. It signifies that Kejriwal thinks and decides to do something and walk alone. The person having this arrow of loneliness in the chart avoids personal feelings and found to be so intent on achieving his goals that he forgets his friends and family and consequently lack joy, love and laughter in his life. Such people usually suffer enormously from loneliness in their old age. Analysis of Western Lo Shu Grid Besides all the similarities from the other two charts there is one inherent weakness in this chart in the form of Arrow of Skepticism. The people having this arrow are idealists and have strong visionary capabilities that can make them highly intuitive. These people are loving, honest and fair but frequently find it difficult to express these feelings to others. The people with this combination in their charts like to see things demonstrated or proven rather than accepting things on trust. Arvind Kejriwal has all such traits. US President Abraham Lincoln also had Arrow of skepticism in his chart. In Western Lo Shu also, Material Plane forms the Arrow of Strength which shows his high ambition and latent desire to achieve unfathomable success at top brass materially and powerwise.Missing Numbers In the date of birth of Arvind Kejriwal, many numbers are missing. Most frequently missed numbers in all the variants of Lo Shu Grid are 2,3,4,5 & 7. Most of these numbers are supplemented and getting vibrations from those numbers present in the name in abundance except 7. There is absence of Number 7 in the chart. However, the deficiency of this number is overlooked by the presence of multiple forces of 9 present in date of birth and name. The outstanding features in Arvind Kejriwal’s chart are the presence of multiple forces of numbers 1, 5 & 9 which give him enormous energy to take new initiatives meant for humanitarianism and philanthropic activities tirelessly and with constructive freedom. He does not hesitate even challenging the rock solid politicians and even Government. He made a dream debut in politics and he not only defeated the senior politician and 3 time Delhi Chief Minister Sheila Dikshit but his party became able to form the Government under his leadership and he was designated the Chief Minister of Delhi. Though due to his ideologies he resigned. He must learn to keep a check on his emotions and take decisions after pondering over a lot. There are indications that if he checks his materialist designs and devote himself in humanitarian cause to ameliorate the lot of the people, he will achieve name, fame and recognition and the world will remember him for centuries. Politics is probably not bed of roses for him and in the powerplay he has nothing to gain. He is made to take care of the people through philanthropic activities not through wielding power around him by becoming C.M. or P.M. 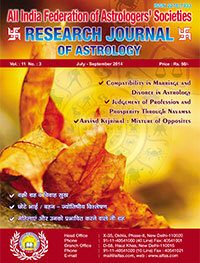 In this Health and Marriage Special Issue of Research Journal of Astrology there are several articles on topics like compatibility in marriage, divorce and astrology, Marriages are settled in heaven, retrograde planet and marital bliss etc . Some health Issues are also covered in articles like Paralysis ; Reasons and Remedies, Analysis of an accident through Yogini Dasha and Varshphal. In Addition there are several other interesting articles like preferential methodology of divisional charts, saturn's transit in Vishakha Nakshatra, Mundane Astrology, Numerological analysis of Arvind Kejriwal.